Dr. Webster is a 2006 graduate of University of Missouri - St. Louis College of Optometry. During school she was a member of the Beta Sigma Kappa optometry honors society. Since graduation she has been in practice at In Vision Eye Care Center. Currently she is a member of the Central Missouri Optometric Society, Missouri Optometric Society, and American Optometric Association. ​Dr. Webster graduated from the MU Crosby MBA program in December 2014. Prior to optometry school Dr. Webster received her B.S. degree in Biological Sciences from the University of Missouri - Columbia. High school was completed at Clark County R-1 in Kahoka, MO where she spent her childhood. 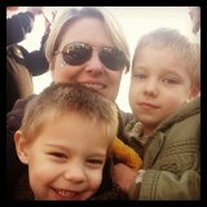 Heather and her husband Eric now have two beautiful, (albeit ornery) sons. Their son, Rhys Brennan Webster, was born on October 6, 2010. He joined their older son, Breckin Robert Webster, who was born October 18, 2008. She and the boys are all keeping very busy and doing great! Dr. Andersen is a 2017 graduate of University of Missouri - St. Louis College of Optometry. She joined us at In Vision June 2017. Dr. Andersen grew up in La Crosse, Wisconsin and graduated from Winona State University in Winona, MN with a B.S. degree in Cellular and Molecular Biology and minor in Psychology. Dr. Andersen enjoys volunteering and has participated in many community health screenings. She plans to continue volunteering and being active here in Columbia, MO. In her free time she enjoys playing tennis, traveling, and spending time at the Lake of the Ozarks with her husband Dr. Cord Linville and their dog Brodie. Dr. Linville is a 2018 graduate of University of Missouri - St. Louis College of Optometry. We are so excited to have him on board! His externships included community health care clinics, private practice, educational facilities, and the Harry S.Truman Columbia VA. His rotation schedule was heavy in ocular disease, contact lens, and dry eye. Dr. Linville grew up in Jefferson City, MO and graduated from Helias in 2009. He went to undergrad at University of Missouri - Columbia (Go Tigers!). While at Mizzou he was a member of the Beta Theta Pi fraternity. In his free time he enjoys golfing, boating, scuba diving, skiing, and traveling. He is a current member of the Missouri Optometric Association, American Optometric Association, and Central Missouri Optometric Society. Misty has returned to us after having worked at our old location from 1999-2005. She did a stint as a pharmacy technician, but decided she liked eyeballs better. Misty was born in Columbia, MO. She is a huge animal lover with two adorable cats named Cola and Lucky. Allie has been with us since April of 2017. Allie was born in Monroe, Louisiana but grew up here in Columbia, MO. She is a junior at the University of Missouri majoring in Biology minoring in Human Development and Family Sciences with a future goal of becoming an optometrist. Allie enjoys traveling in her free time, she recently returned from a trip to Ghana in May 2018. Michael has been with us since May 2017! He grew up in Springfield, MO. He graduated in 2018 from the University of Missouri with a Biology major and Business minor. Michael has been accepted into the UMSL Optometry class of 2023 and will be moving to St. Louis in August! In his free time he enjoys playing soccer and sand volleyball. Jill is from Sedalia, MO and has been with us since March 2018. She is a currently a junior at the University of Missouri majoring in Health Science and minoring in Psychology. Her future goal is to become an Optometrist. In her free time she enjoys playing soccer and traveling.